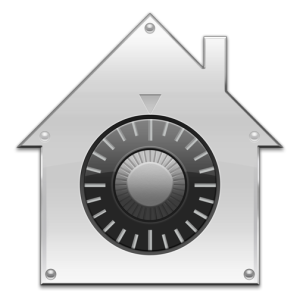 Gatekeeper is an application level security feature on the Mac that aims to prevent unauthorized and unidentified apps from being launched in Mac OS X, thereby preventing potential security problems like exploits or trojans from running on a Mac. The feature is most often encountered when an app has been downloaded from the web, and upon attempting to launch the app a warning dialog will prompt the user with a message saying something along the lines of “This app can’t be opened because it is from an unidentified developer“. We’ve covered how you can get bypass that error message on a case-by-case basis by using the right-click “Open” trick, but the latest version of Mac OS X brings another option which may be easier for some users to selectively launch apps and bypass Gatekeeper. This is advantageous because users can continue to retain the strict security preference of leaving Gatekeeper enabled and intact, which is generally recommended. This solution is temporary, providing a per-application launch bypass. It does not disable Gatekeeper in Mac OS X. The full Security preference panel looks like the following, with Open Anyway highlighted within the Gatekeeper section. If the “Open Anyway” option is not visible then you likely must unlock the security preferences by clicking the little padlock icon in the corner and entering an administrative password. 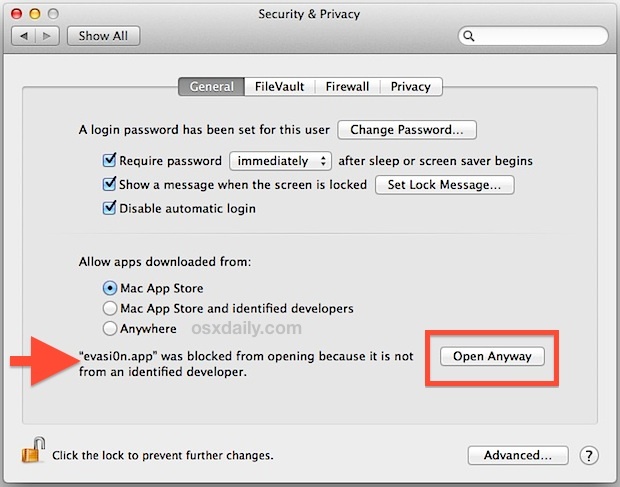 Choosing “Open Anyway” will launch the application in question directly from Security System Preferences, and you’ll be able to use it as normal. This approach is obviously slightly more time consuming than using the right-click Open trick, but it may be advantageous for certain users in select situations. Gatekeeper is really aimed at protecting novice and average Mac users, while advanced Mac OS X users who are more comfortable with things may find the warnings to be intrusive or annoying. If you don’t want to receive the warnings at all, you can simply disable Gatekeeper completely through the Security System Preferences by choosing “Anywhere” from the allow apps list. This feature was first introduced to the Mac with OS X Mountain Lion, but the “Open Anyway” option inside the Security preferences is new with OS X Mavericks onward to Yosemite, El Capitan, Sierra, and beyond with macOS. Related to this is the Java wariness. When I open http://seattletimes.nwsource.com/crossword/ , for instance, I get a “Do you want to run this application?” message window, which says This application will be blocked in a future Java security update because the JAR file manifest does not contain the Permissions attribute. …” This is one of many harmless sites where Java is an intrinsic ingredient. What can be done about this current irritation and future blockage? Thank you for this article, short and sweet. I find it amazing that an UPGRADE where the system clearly finds that some user created prefs and files date from 2004 finds it neccessary to moan about apps that have been on you Mac for ages. What is the point of treating everbody as a ‘novice’ read moron ? why don’t they even bother to ask or explain? Apple should pay people like you for fixing their problems. Do you know how to even get into system preferences if it’s been blocked by a school or something? My permissions won’t let me, because of 7zip. I need to use it for one of my files that I need to recover (no other programs are safe to even try). Thanks! Gatekeeper ruined my dashboard development completely. After following directions, I still get and ***ERROR: Resolution was not changed message. I’m trying to print coupons from coupons.com and they print very tiny. I’m bummed. After following directions, I still get and ***ERROR: Resolution was not changed message. I’m trying to print coupons from coupons.com and they print very tiny. How do we fix this!!!!! I want allow to non app store apps but disable/block few apps of my own choice (for e.g: torrent ). How it can be done ? Now I need to return basic settings. How can i do that ? I want to take back my permissions to launch the apps ? Do you know any commands to restore all settings? i downloaded endnote in my computer however it was not opening as it says someone else is using it already? i just cant seem to understand. coz all the windows are closed. can you pls help rectify this problem? Gatekeeper likely won’t impact that at all, as it manages security of signed apps and unsigned apps. For your issue, the EndNote process must be running on the Mac somewhere if it thinks the app is currently open, either on your user account or as another user account that is logged in. You might try simply restarting the Mac then opening the application again.